WHEW!!!! Between Honolulu's Democrat dominated City Charter Commission and the State's Democrat dominated State Legislature, these government-worshiping liberals came up with 22 different ballot measures to make this year's General Election ballot pretty darn complicated for Oahu voters. And that's before you add in thirteen more from Kauai, Maui and the Big Island counties. Who knew that democracy could be so complicated? But HIRA is here to help 'uncomplicate' things with our official 2016 General Election Voter Guide; free to all Republicans statewide. CLICK TO DOWNLOAD HERE. HIRA's hardworking volunteer conservatives who serve on our Charter & Constitution Committee worked hard to sift through the pros and cons of each and every one of the state and county measures (including the many Trojan horses) so we could provide the best advice to island Republicans. 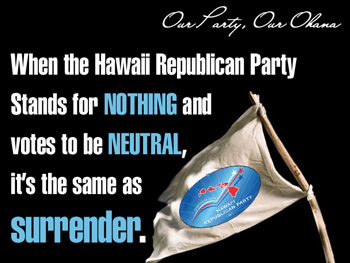 The stakes got even higher when we realized that the Hawaii GOP's leadership was deliberately preventing the Platform and Resolutions Committee (which is a standing committee) from even meeting to track ballot measures and/or proposing recommendations to Republicans at this critical time. Reportedly, the Democrat Party and the Libertarian Party are providing their members with guidance on these charter amendments. But with the state GOP's Platform Committee completely emasculated by Team Hellreich, and with general election ballots already arriving in the mail, there was no time to waste in preparing and distributing HIRA's Official Voter Guide for the 2016 General Election. Keep HIRA's guide handy while you fill out your ballot at home . 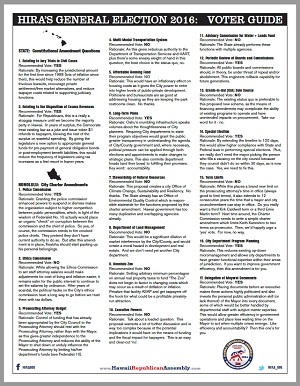 We've provided an easy-to-read, 2-page PDF which ready to print and take with you to the polls. Early voting starts next week. And, of course THE BIG DAY (November 8th) is just two and a half weeks from now. In HIRA's guide, you'll see lot of recommended "no" votes, but there are some definite "yes" recommendations from HIRA too. There are even a couple of "whatevers" for which you might just do a coin toss before 'dimpling the chad' of your ballot. WARNING : Because Team Hellreich and party chairman Fritz Rohlfing have prevented the party's standing platform committee from fulfilling its duties, Empress Hellreich has taken it upon herself to use the party mailing list to advise voters to VOTE NO ON EVERYTHING. This is a terrible and uninformed disaster of a suggestion. Party leaders have had months to study these proposals -- with a $15,000 per month budget for overhead. But platform committee members were locked out of party headquarters all this time and told that their services would no longer be needed. Just terrible!! So please ignore Miriam Hellreich's extremely terrible, capricious and arbitrary advice ("vote no on everything") on how to cast your ballot. 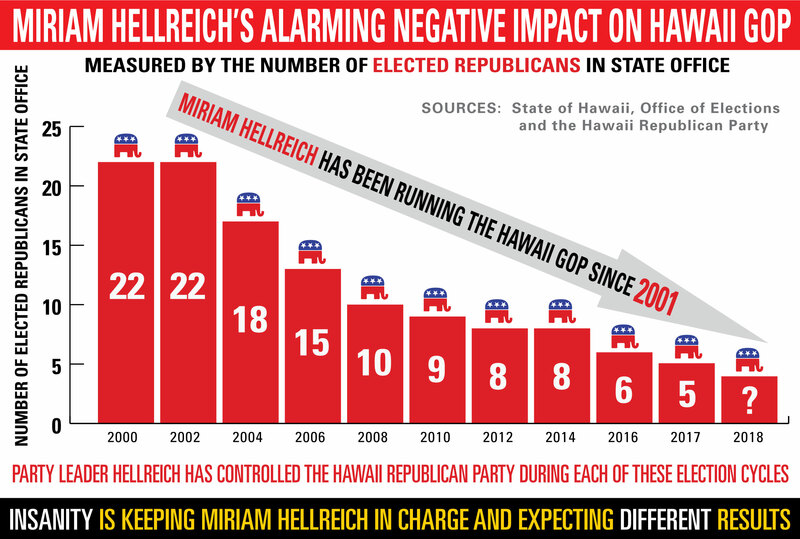 HIRA strongly advises that you NOT blindly vote "no" on every single ballot measure, like Hellreich is telling you on behalf of the Hawaii GOP. Conservatives and Republicans need to know that several ballot measures are definite "yes" votes. In fact, you've really got to be quite careful how you vote, because this is the exact same process Charles Djou used to create HART in 2010. And many of us would give our right hand to repeal that horrible City HART agency, which has almost tripled the cost of rail construction from $3.9 billion in 2008 to nearly $11 billion today; with HART receiving ZERO oversight or accountability by the mayor or the city council. It's a total disaster!! 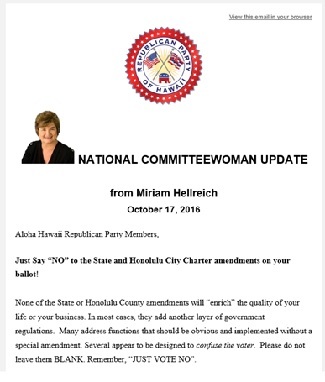 Finally, HIRA is really happy to pinch hit for our rudderless, beleaguered Hellreich-hijacked Hawaii GOP in providing this voters guidance now that ballots have begun to arrive in our mailboxes. There's a lot at stake. Hopefully, new and talented (and conservative) party leadership in 2017 will allow the platform committee to realize its full potential of researching issues, tracking legislation, grading ballot measures, and (most of all) performing useful opposition research on Democrats and their failed policies. Anyway, without further ado, please click HERE to download the 2-page PDF: HIRA's Voter Guide for 2016 which we proudly submit for your consideration. This pivotal election has already started -- and 'voting right' has never been so important as it is this year. And while sad times have truly befallen our dysfunctional Hawaii GOP organization, HIRA is proud to help island Republicans decide the direction of our state and our four counties. Corner of N. King St. & Kalihi St.
A CALL TO ARMS: Fellow Republicans, once this election is behind us, we invite you to work with HIRA to salvage our party organization, so we can restore Republican credibility and fix our embattled party brand in Hawaii. Like you, we've heard the terrible news that our mismanaged and corruption-plagued Hawaii GOP has practically run out of money and it's barely raising more than $2,000 per month for every $15,000 it spends (on overhead alone) because inept RINO party officers have run the GOP into the ground. We've even heard that all those tens and tens of thousands of dollars raised explicitly "for the mortgage" has mostly vanished. With your kokua, in 2017 we can turn our state party into a lean fighting machine which puts its time, energy, talent and funds into educating and persuading voters that our candidates and our policies will make their lives better in advance of the 2018 election. Until that effort led by HIRA gets underway, please do all you can to DIRECTLY support our brave candidates. Please don't donate a single penny to the RINO-hijacked Hawaii Republican Party organization, as they'll keep blowing everything you contribute on everything EXCEPT what's needed to make it possible for GOP candidates to win. The numbers don't lie for the past two decades . . . or now!! Finally, THANK YOU for your kokua to our candidates and for your help rescuing our party and our beloved Hawaii from failed progressive policies. Let's work together put conservatives (a.k.a. "real Republicans") into office the Aloha State and show our neighbors how much better their lives can be with a Republican majority as quickly as possible.